I am a great fan of Podcasts and thought it would be useful to list the main Tolkien Podcasts that are currently available. I am not including Lord of the Rings Online Podcasts. I think most people on this site will know what a podcast is, but just in case it is an audio or video file that you can download to your computer or portable device and listen to. Most podcasts can be subscribed to using an application like iTunes and new episodes are automatically downloaded when they are published. This Podcast has some interesting interviews mainly about the films but I have problems with the audio quality and have recently stopped listening. I am sure that the audio issues will be resolved and then I'll listen again. Middle-earth Minutes is up to episode 7 and I was not a huge fan when it first started, as the presenter (Michael Kaiser) just read out news stories. That all changed in the last couple of episodes as Beren is now a regular guest on the show. This forum got a mention on the last episode as well. I can only find this through iTunes in the iTunes University (do a search for Tolkien at Oxford in iTunes). Two episodes so far on Tolkien and Languages and Tolkien and the Oxford English Dictionary. Michael Martinez and Hawke discuss news stories on this podcast. The episodes are often recorded a long time before they are released so a lot of the news events are often in the past. They also have not yet done a RSS feed for the episodes so you cannot subscribe using iTunes or a similar podcatcher and automatically get new episodes. I have left the best Tolkien podcast to last. It has been quite quiet recently as Cory Olsen has not had time to devote to the extensive research which goes into each of his podcasts. The audio quality is also excellent on this podcast and at the moment if you were to listen to just one Tolkien podcast then I recommend this one. Finally, I just thought that I would also mention my favourite podcast which is not Tolkien related. I am also very interested in history and a superb podcast has been produced by Mike Duncan called The History of Rome. The amount of research put in to each episode is staggering and he has produced 78 episodes so far. Have I missed any other Tolkien podcasts of note? or can anyone else recommend any other really good podcasts. Also thanks from me for posting this list! I have been following the Tolkien Professor one (who by the way is now one of the staff at the Festival in the Shire Journal,) but was not aware of all of the others. In case people don't know this, Cory Olsen (The Tolkien Professor) is making available all his lectures to students as a podcast. It's nice that this is possible today and I recommend listening. Stuart Lee and Elizabeth Solopova discuss the influences of medieval literature on the fiction of J. R. R. Tolkien. Judith Priestman, curator of the Bodleian library, discusses the World Book Day 2010 exhibition, where a selection of J.R.R. Tolkien's original artwork which was used to illustrate The Hobbit, was on display to the public. An interesting episode of the Biblio File podcast (http://nigelbeale.libsyn.com/) which deals with a large range of topics, author, book seller, bibliographers, etc. interviews. This one is with Professor Iain Stevenson on the history of 20th Century British Publishing Houses and has some interesting comments on George Allen, G&AU and Sir Stanley Unwin. Iain Stevenson has worked with Longman, Macmillan, Pinter, Leicester University Press, Wiley, and The Stationery Office. In 1986 he founded the environmental publisher Belhaven Press. He created the award winning MA in Publishing Studies at City University London and was a Professor in the Department of Journalism and Publishing there between 1999 and 2006. He is active on the governing and advisory board of the Publishers Association. Current research is centred upon the history of British publishing and the applications of new technology in publishing, especially e-books and alternatives to the printed monograph in academic and scholarly communication. We met recently to talk about his excellent new book, Book Makers: British Publishing in the Twentieth Century, published by British Library. A podcast with Tom Shippey, excellent and highly recommended. Thanks, Trotter. I've just listened to it; I think it's marvellous! 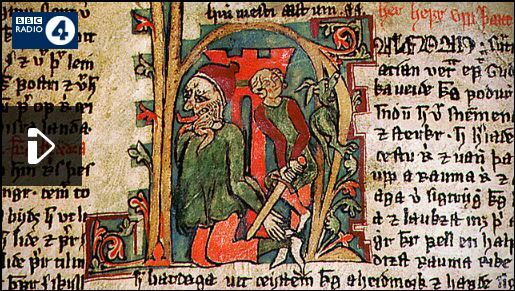 The Icelandic Sagas were first written down in the 13th century and tell the stories of the Norse settlers who began to arrive in Iceland 400 years before. They contain some of the richest and most extraordinary writing of the Middle Ages. Full of heroes, feuds, ghosts and outlaws, the sagas inspired later writers including Sir Walter Scott, William Morris and WH Auden. Melvyn Bragg is joined by Carolyne Larrington, Fellow and Tutor in Medieval English Literature at St John's College, Oxford; Elizabeth Ashman Rowe, University Lecturer in Scandinavian History at the University of Cambridge and Emily Lethbridge, Post-Doctoral Researcher at the Árni Magnússon Manuscripts Institute in Reykjavík.